Ben is my First Cousin Once Removed (FCOR) as he is the child of my first cousin, Lesley. Many people in America don’t immediately get that genealogical gem upon introduction. Furthermore, trying that relational explanation when traveling with him through Laos, Cambodia and Thailand generally complicated things. Ordering a drink at the bar in Ubon Ratchithani, for example, could become downright onerous when proffering such an exact ancestral narrative. Apart from being the only two white guys in the place, there was just a touch of familial resemblance causing the ESL (English as a Second Language) barmaid to look at the younger windswept version and thence to me and to utter “Papa?” Or worse, “Grandpa?” Yes that actually happened. I vainly tried to go with cousin for a while, but that did not really fly. Generationally inconceivable I suppose. 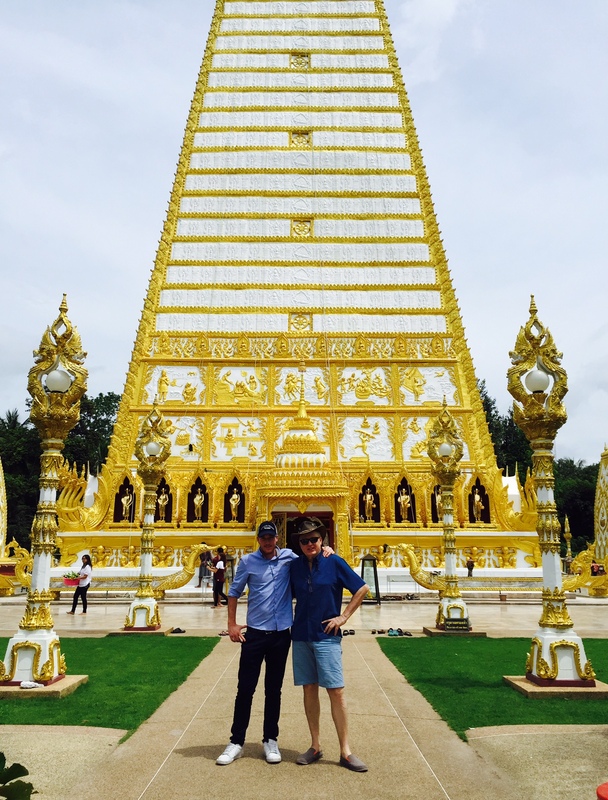 Ben with his First Cousin Once Removed at the impressive Wat Nong Bua in Ubon Ratchathani. Therefore, in order to preserve a modicum of dignity I abdicated to the use of Nephew. I learned the phrase, “my nephew” in three different South East Asian languages in order to move beyond the recurring nightly guess-who-the-old-guy-is part of the introductory conversation. That worked, although I secretly preferred cousin, seemingly harboring a smidge of resentment. Now Ben, my FCOR, is a great sport and he went along happily with all my various stages of denial. However, we often failed to coordinate our opening remarks upon making acquaintances. Simultaneously sometimes, depending on who was talking, he was my cousin while I was his uncle, or I was his cousin while he was my nephew. Only when we were rumbled would I have to revert, clumsily, to a textbook description of first cousin once removed. Which would take the air out of the room. 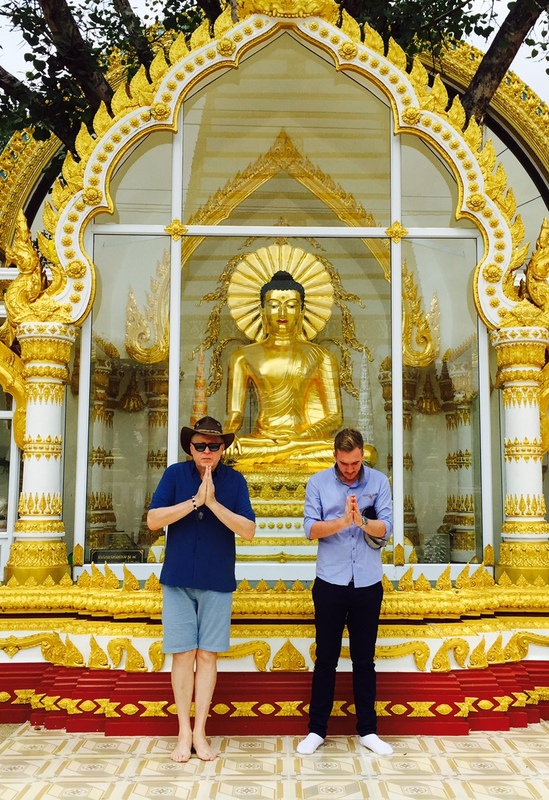 The cousins pay respect to the Buddha. 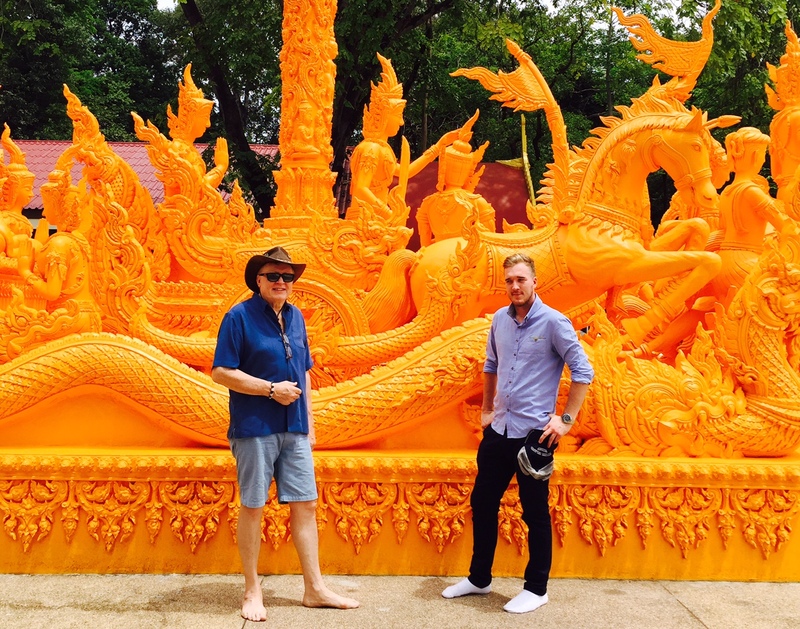 Ben and Papa admiring one of the many temple adornments around Ubon. 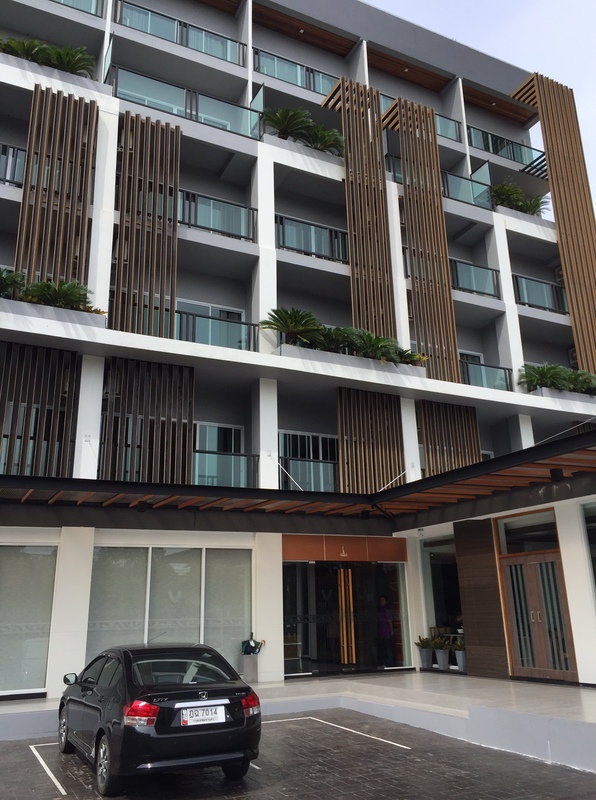 We stayed at the V Hotel, which is a delightfully functional and clean hotel located on some random road that leads into the Thai Isan town of Ubon Ratchathani. The hotel seems as though it is totally new and had just opened the week before we arrived. Almost had that new hotel smell. While the reception staff could’ve peaked a little more in the ubiquitous Thai smile department one often hears about, they made up for any perceived shortcoming with their lightning efficiency. The hotel décor is reminiscent of a day imprisoned in an Ikea showroom with sharp wooden edges juxtaposed with granity-looking surfaces and floors, the occasional fake plant, and pastel shaded walls that eschew any form of painting or other adornment. The hotel is baroque in a modern, Scandinavian way and very clean, while usefully located near the town center. Ubon Ratchithani is one of the “big four” towns dotting across Isan, pronounced Eeeessaaan, by the locals. A practical though somewhat austere breakfast is included in the most reasonable room rate. For breakfast they had eggs, salad, as well as something Asian-looking. But I was fortunate to spot a large dish of yoghurt that I selfishly scooped pretty much entirely into my bowl, only to realize minutes later that it was salad dressing. Which explained perfectly the stares I got from the folks in the salad line. Those western first cousin whatever tourists. This entry was posted in Travel Review and tagged isan, ubon, ubon ratchithani, wat nong bua. Bookmark the permalink. Grandpa….ouch! Following your journey with interest and love the photos!